“The goal is nothing less than to create superalgae, highly efficient at converting sunlight and carbon dioxide into lipids and oils that can be sent to a refinery and made into diesel or jet fuel. I’m sure you’ve seen a lot of commercials on television promoting corn ethanol to take advantage of the BP oil spill. Friends of the Earth punches back in this video. This was done by Friends of the Earth! Washington, D.C. Congressman Collin Peterson, chairman of the powerful House Agriculture Committee, prevailed against tough competition to receive Friends of the Earth’s annual Biofool of the Year award, which was delivered to his office on Monday. With almost 2,300 votes, Chairman Peterson was the clear winner amongst the five nominees. His past Biofoolery includes: demanding that the EPA stop factoring deforestation into environmental impact assessments of biofuels, trying to exempt dirty biofuels from key global warming standards, and trying to open forests and natural areas for biofuels exploitation. Peterson is currently co-sponsoring H.R. 4940, which extends billions of dollars in tax credits to oil companies for conventional corn ethanol production, despite scientific analysis indicating that corn ethanol creates more greenhouse gas emissions than gasoline. Corn ethanol also contributes to water pollution, habitat destruction, soil erosion and health issues from pesticide and herbicide use. Friends of the Earth President Erich Pica joined McMahon to present Congressman Peterson with a certificate, a congratulatory petition signed by over 700 people, and a celebratory can of corn. A video of the presentation is available at: http://www.foe.org/happy-biofools-day. Friends of the Earth’s annual Biofool of the Year Award was established to recognize leaders that promote dirty biofuels. The 2009 winner was Hugh Grant of Monsanto. This struck me as a noteworthy development in the ethanol arena. From Jessica Leber of ClimateWire, which can be found here. Excerpts below. “Novozymes, the world’s largest industrial enzyme producer, today launched a new line it says will yield ethanol from plant wastes at an enzyme price of about 50 cents a gallon. The latest product of a decade of research, this marks an 80 percent price drop from two years ago, according to Global Marketing Director Poul Ruben Andersen. “Genencor’s Lavielle cautioned that the 50-cent-per-gallon estimate for the cost of cellulosic ethanol is closely tied to the particulars and efficiencies of the production process. He said that, over the next several years, the company hopes to halve the enzyme costs again, to 20 or 30 cents a gallon of fuel. Airlines Demand to be Regulated?!?! I mean I’m real glad to read this. It’s kind of like “well if it’s good enough for them….I don’t want to hear anyone else complaining”. So four of the largest airlines in the world have asked for a global cap and trade scheme that would regulate and put a price on their carbon emissions. HERE is the link. Story is also posted below. They may be an unlikely green lobby, but four of the world’s largest airline companies have called on governments to be stricter with them. British Airways, Air France-KLM, Cathay Pacific and Virgin Atlantic have joined forces with the British Airports Authority and The Climate Group, a policy consultancy, in a proposal for a global cap-and-trade scheme that would regulate airline emissions. The airlines want their proposal to be included in the next global emissions agreement, scheduled to be signed in December. The move was announced at the close of 10 days of climate negotiations held in Bonn, Germany, this week. The UN estimates air transport is responsible for roughly 3 per cent of human greenhouse gas emissions worldwide. Without action, its share could rise to 15 per cent by 2050. Yet the industry is not yet required to reduce its emissions – even under the Kyoto protocol. The European Union and the US have each discussed independently regulating aviation emissions. But Paul Steele, executive director of the Air Transport Action Group says the industry would rather governments “take a global approach for aviation rather than the current patchwork of national and regional emissions management schemes”. A spokesperson for Greenpeace told New Scientist the organisation felt the first priority for the transport industry should be to stop expanding. 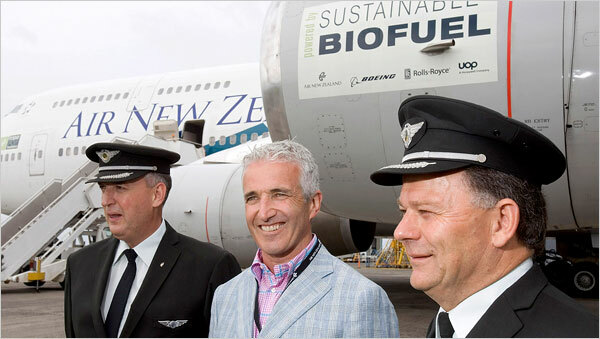 The airlines hope stricter regulations could stimulate the adoption of greener aviation fuels, such as biofuels.